Envisioning the World: Henry and Holly Wendt Donate Historic World Map Collection. Ptolemy (Claudius Ptolemaeus). Untitled Map of the World. Ulm, Germany, 1482. An extraordinary collection of world maps, dating from 1472 to 1700, has found a permanent home in the Historic Maps Collection of the Princeton University Library. Collected by Henry Wendt, Class of 1955, and his wife, Holly, the thirty items have been traveling around the country for the past three years as an exhibition, “Envisioning the World: The First Printed Maps, 1472-1700.” Firestone Library’s Leonard L. Milberg Gallery for the Graphic Arts hosted the show in early 2010. • 1472–1502: “Printing, the Bible, and Ancient Wisdom” (8 maps). Included is the first printed map, Saint Isidore’s simple woodcut (1472) showing three continents in the form of a T, encircled by an ocean, an O—hence, the beginning of what became known as T-O maps. At the center is Eden, and the continents reflect the dispersal of Noah’s sons (Shem, Ham, Japheth) after the Great Flood. • 1504–1548: “The Age of Exploration” (7 maps). “Typus Cosmographicus Universalis” (1532) by the German cartographer Sebastian Münster belongs to this group. Coming ten years after Ferdinand Magellan’s voyage of circumnavigation, the map reflects the curvature of the Earth and contains rudimentary shapes for North and South America. Sea monsters still ply the oceans. • 1570–1640: “Worldviews Collide” (8 maps). The golden age of Dutch mapmaking art is represented by the world map of Willem Janszoon Blaeu, “Nova totius terrarum orbis geographica ac hydrographica tabula” (1630). 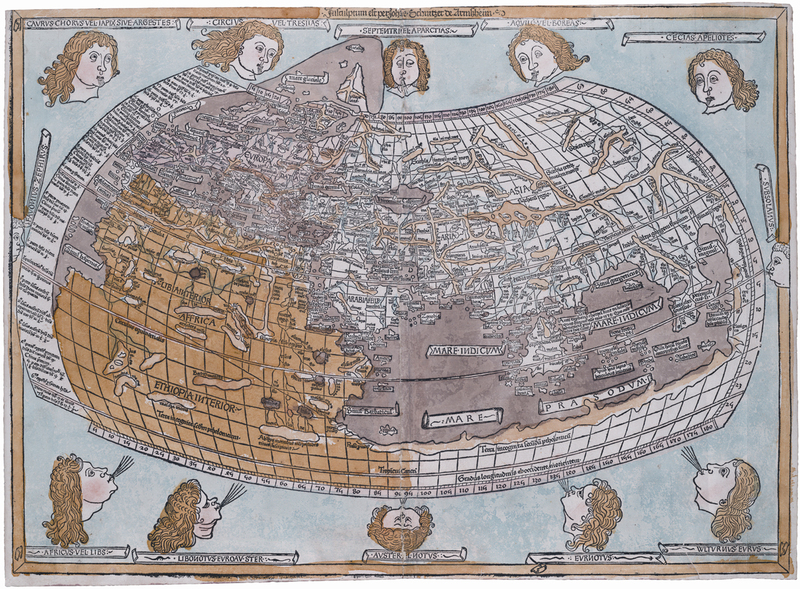 Superb copperplate engraving and hand coloring offer a cartographic feast. Surrounding the Mercator projection of the world are insets of the seven wonders of the world and figures representing the four seasons, the four elements, and seven astronomical bodies (the sun, moon, and five planets)—illustrating the carte-à-figures style of border decoration. • 1657–1700: “The World Measured: Science Comes of Age” (6 maps). “Nova & Accuratissima totius terrarum orbis tabula nautica variationum magneticarum . . . ,” by the English astronomer Edmond Halley, typifies a more modern approach to mapmaking: a thematic overlay of the known geography with objective data—in this case, isogonic lines indicating variances in the Earth’s magnetic field—to interpret natural phenomena. No wind heads, monsters, or religious imagery embellish the science. As Wendt noted, this scientific method endures in cartography with global positioning systems, satellite photography, and space exploration. 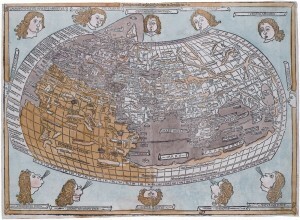 Wendt’s collection also includes Abraham Ortelius’s historical map “Tabula Peuteringeriana,” more commonly known as the “Peutinger Table.” First printed in 1598 and based on a thirteenth-century manuscript scroll now housed in the national library of Austria, the map presents the cursus publicus, the network of roads originally created for couriers of the Roman emperors. In eight AAA TripTik–like sections, the map provides a compressed, linear view of the world similar in function to a subway map today. Only the essential elements for travelers remain: distance in terms of a day’s hike, symbols for places to stop for food and shelter, only the rudiments of rivers and other topography. A fascinating world view from the perspective of the Romans. The maps are in the process of being catalogued and scanned; high-resolution copies will be available to the public, linked from the library’s online catalog records. Collecting maps and producing fine wines have been passions of the former SmithKline Beecham chairman/CEO and proprietor of Quivera Vineyards and Winery; Princeton is certainly another. The Historic Maps Collection has been greatly enriched by this thoughtful and generous donation, just one in a long list of significant gifts and endowments to the university from Holly and Henry Wendt.